Diane has studied composition privately with Johanna Selleck, and at the VCA and Monash University. Writing works for her own groups e.g.firstly Archaeopteryx Harp and voice ; double bass; drums; trombone; saxophone; and often trumpet and flute,then combinations not including harp e.g. string trio for double bass, viola and cello, played as part of the larger work Project Sunrise. 2003, combining these string instruments with the jazz sound of the drums and trumpet,harp,flute and extra bass player. Diane Peters first work for orchestra #53 Hillarion (for orchestra with jazz saxophone) was performed by the Monash Orchestra, conducted by Timothy Phillips, Melbourne October 2004. 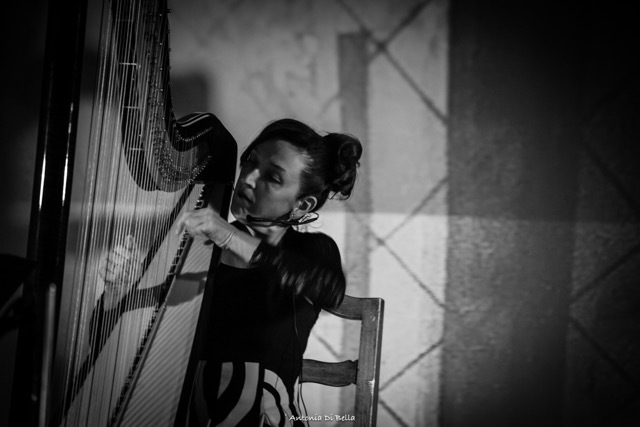 Her own film score for harp and piano featured as the music for Australian short film One Step Back by Mark Robinson Appearing in Melbourne International film festival, and winning numerous awards and screenings internationally. Diane has played session harp for other composers film scores including Paul Grabowsky and Cezary Scubizewski. written in the occasion of the annual "festa della fae" organized by the pro loco of San Giorgio. Using pre recorded sounds, and ideas from medieval times, transforming them, with a special attention to the use of the sounds of the working of the marble, for both sculpture "arte" and "construction", particular to the location. The base of which the inspiration for the suite of music was composed. Scritta per l'occasione della "festa della fae" organizata dalla Proloco di San Giorgio. Utilizando suoni preregistrati, ed idee dal medioevo, trasformandoli, con attenzione particolare al suono della lavorazione del marmo, per sculture "arte" e "costruzione", specifica del luogo. Questa è la base da cui è venuta l'ispirazione per questa suite di musica . performed by the "Trio Amarone "
Melbourne-Australia, combining harp and voice with the use of super 8 film and lighting effects and recorded voices and sounds. MIUC is (improvised music association) assisted by the Australia Council. Also appering in duo with Maria Vicentini on an Australian visit in 2009 , playing free!- Harp and Viola. Franzke and Peters (Melbourne) a collaboration of harp and computer Franzke and Peters have collaborated using DJ and improvisation along with co composed pieces utilising computer effects and voice. This combination has appeared numerous times at Honkeytonks night club in Melbourne a modern and atmospheric sound.Their work was utilised in the Melbourne International festival of the Arts project and in sound works of David Franzke for Melbourne Theatre Company. Diane improvised Per Anders Nilsson Swedish composer, computer and harp,during his workshop at Verona Conservatorium. -Solo at Tonic jazz improvisation club in New York 2000, curated by Jon Rose. -As part of “Verona Risuona 2007″Collaboration with Staffan Mossenmark Swedish composer with harp and tractor! piazza bra in Verona, then “Il Cigno ” “The swan” a tounge in cheek re working of sean seans “The swan”, to include not only harp and cello but tuba, double bass violin and improvvisation, again in the centre of verona. and in 2014 with Trumpets crumpets Trumpets, as composer and conductor of trumpets playing from windows over looking the historical centre of Verona. In Italy - Diane plays in improvising groups from jazz to original , electronic, and is also a member of MOSAIKA , a Verona based orchestra.